Dual Certified Fire Gear: What’s Best For Your Fire Department? Firefighters are always on call, but when it comes to emergency preparedness, turnout gear is not always required. Wearing full turnout gear every day, even for non-emergency calls shortens the lifespan of your gear. Investing in dual certified fire gear to outfit your department for non-fire related emergencies can save you money. In scenarios where full bunker gear is not required, your best choice is Lakeland Dual Certified Gear. Why? 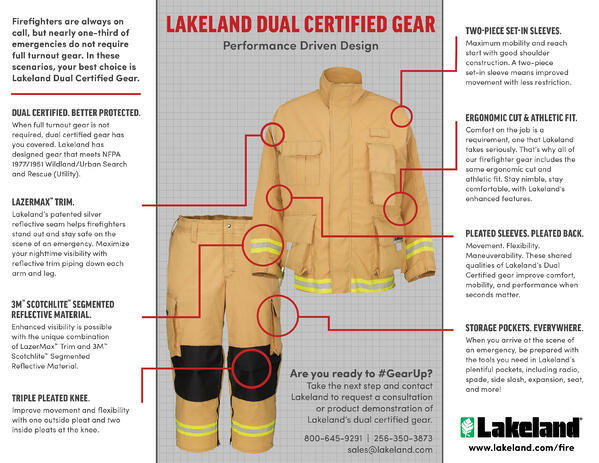 Take a look at our PDF Dual Certified Fire Gear Infographic in detail to see why Lakeland Dual Certified Fire Gear might be the right choice for your fire department. What is Dual Certified Gear? Dual Certified fire gear means that garments meet two National Fire Protection Association (NFPA) standards. Ergonomic Cut and Athletic Fit. Comfort on the job is a requirement, one that Lakeland takes seriously. That’s why all of our firefighter gear includes the same ergonomic cut and athletic fit. Stay nimble, stay comfortable, with Lakeland’s enhanced features. Movement. Flexibility. Maneuverability. These shared qualities of Lakeland’s Dual Certified gear improve comfort, mobility, and performance when seconds matter. The best-designed knee on the market, Lakeland’s Dual Certified pant offers a triple knee pleat, improving flexibility and movement. Lakeland’s patented silver reflective seam helps firefighters stand out and stay safe on the scene of an emergency. Maximize your nighttime visibility with reflective trim piping down each arm and leg. 3M™ Scotchlite™ Segmented Reflective Material. Enhanced visibility is possible with the unique combination of LazerMax™ Trim and 3M™ Scotchlite™ Segmented Reflective Material. When you arrive at the scene of an emergency, be prepared with the tools you need in Lakeland’s plentiful pockets, including radio, spade, side slash, expansion, seat, and more! Maximum mobility and reach start with good shoulder construction. A two-piece set-in sleeve means improved movement with less restriction. If you’re interested in learning more, take a look at Lakeland’s robust line of fire service gear.